Your registration is documented with a high quality, personalized identification card indicating that you have registered your animal to be a "Service Animal" and claim the protection of all rights as described by the DOJ (Department of Justice), the Americans with Disabilities act of 1990, as well as the revised protection of the ADA Amendments Act of 2008, effective as of January 1, 2009. On the reverse side of this identification card is a printed copy of the secion of the ADA which indicates your right to claim your animal as a "Service Animal" and to have your Service Animal accompany you in all areas open to the general public, without discrimination or the charge of additional fees. 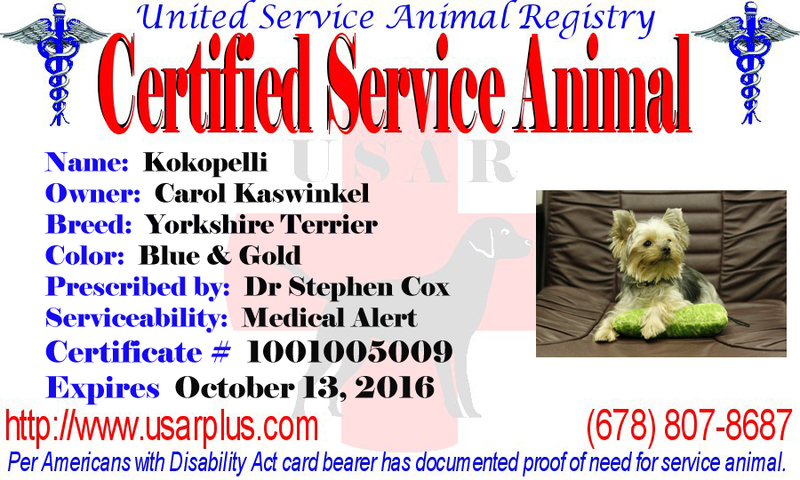 Your Certified ID Card is designed to alert the public that your animal has undergone a more scruitiny than other dogs that do not have to show or prove any disability. With Certified, you will have to get a letter from your doctor that states you have a disability (either short term or life-long) and that you require a Service Animal. Secondly, you need to prove that the animal is current on all shots and is in good health (a letter from your vet), and finally that your animal is a "Good Citizen" dog, having completed some kind of training. 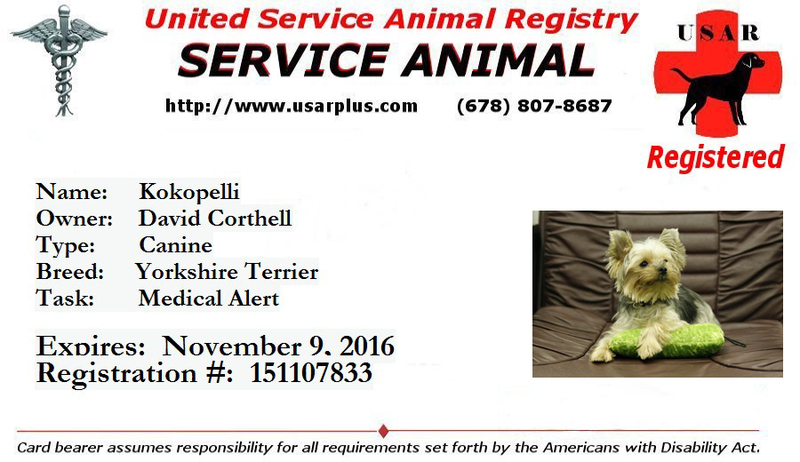 The Certified status allows you to tell anyone to call our company, and we will VERIFY that you need to have your animal with you at all times and it is is illegal to demand you to leave or separate you from your animal. Certified Status is updated each year. Your IP address is: 54.90.86.231!! !